AsQuick Computers, Aspley is your local specialist for Home Computer Repair and everything Home Computer and Laptop. 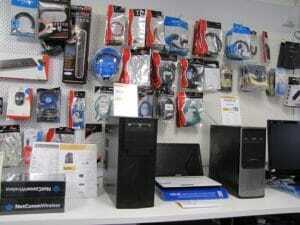 We are experts in home computing and we can help you with home computer repair in Brisbane. Help you decide on your Home computer purchases and with getting your new system installed at your home, or pre-install everything in our Aspley based workshop North Brisbane. In case one of your systems needs upgrading later down the track, or there is an issue, we are available to upgrade or repair your computer systems. We can do this either in our Aspley computer workshop or at your home. Products we have available for you to purchase are desktop computers and laptops and we also can supply everything to get you connected to the world outside, so modems, routers and Wi-Fi. We also have a range of monitors and other peripherals available for you. We will help you setting up your new computer, copy all data from your old harddrive to you New device. We can offer this service for a fixed price when done in our workshop in Aspley. For home calls we have a call-out fee and an houly rate. To make the choice a bit easier, we have put together some computer packages that include everything you need to setup a new home computer system at a very competitive price. Click here for home and business computer packages, or call us to discuss your needs. We provide a range of Asus notebook computers (laptops). Asus is one of the leading manufacturers of notebooks and is at the forefront with innovation and their commitment to quality of their products. We have the latest available for you at any time. We offer Remote Helpdesk Support as well. Although we do computer repairs in our workshop, it can be easier for you to use our remote services. Then you can stay in the comforts of your home and we will basically login to your computer from our computer repair workshop in Brisbane Northside and we can talk you though anything that is happening to your system. Off course for physical repairs, the computer repair service in our workshop will provide you with a solution. Computer repair near me: a convenient way to have your computer or laptop repaired or serviced. So if you live in Brisbane North, you just bring the system into our workshop and we can give you a quote or straight away get started on what needs to be done. This is also an easy way if you need any kind of upgrade to your system, we will have all tools at hand to add extra memory or anything else you need to get your home computer to the next desired level. We repair and upgrade computers, notebooks and laptops of all brands, Macs, and in general all towers, desktops and servers. We can repair your Ipad or tablet screens at a very competitive price. A common issue every computer owner faces are viruses. They can be tricky to detect and even harder to remove. The viruses are constantly being changed and improved and are designed for different purposes. At AsQuick Computers we make sure we constantly stay updated on what happens with new viruses and how to clean them off computer systems. Click here for more information about our services. Almost every computer user at home now wants to be connected to the internet. The phone company will make sure connections to your house are done so you are able to use the internet, but from there on you need to get connections setup yourself. There are some choices to be made as well, especially regarding the possibilities of Wi-Fi. There are different kinds of routers that also will provide you with options regarding the access by every user. This can be helpful for families. Keeping children safe on the internet is a growing concern. Click here for more information. We all now rely on our data being kept on our hard drives. Many people not only have information related to their business on their hard drives, but also many important personal information, like photos. Off course we always encourage people to make sure a backup system is in place, either in the cloud or outside the computer. Unfortunately, this does not always happen due to time constraints or due to incorrect setup. Therefore we sometimes need to try and recover as much as possible of the data on a faulty hard drive. At AsQuick Computers we have a lot of experience in this field and we give customers a ‘No cure, no pay’ guarantee. Click here for more information. Home computers can be challenging house mates!